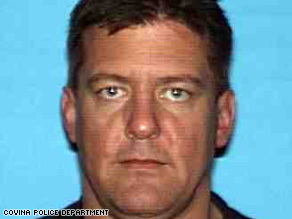 Bruce Jeffrey Pardo went on a shooting rampage in a Los Angeles suburb on Wednesday, police say. Covina Police Chief Kim Raney said Friday that a divorce between the two was finalized in court December 18 in a "somewhat contentious proceeding." On Saturday, Covina police released the names of the nine people unaccounted for since the shooting and fire. Nine bodies were recovered from the rubble of the house, but authorities said they are having to work with dental records to establish identities. "The bodies were so badly burned they cannot be identified any other way," Covina police Lt. Pat Buchanan said. The nine unaccounted for are Sylvia Pardo, her parents, her sister, her two brothers, both brothers' wives and a nephew. Ages of the nine range from 17 to 80, police said. Police said Sunday a car believed to have been rented by Pardo on December 19, a gray Toyota RAV4, was found in the Los Angeles suburb of Glendale. Authorities had cautioned the missing car might be booby-trapped or contain explosives, but it was unclear whether any had been found. Another rented car that Pardo used to flee the scene was found booby-trapped after the shooting, police said. That car burned as the Covina bomb squad was trying to disconnect an explosive device in it, police said. In an interview Saturday with CNN, Alvirez -- who represented Pardo's former girlfriend Elena Lucano in a child support case against Pardo -- said that Pardo and Lucano were in an "off-and-on again relationship" in 2001 and that Pardo was watching their 13-month-old son, Matthew, one Saturday while Lucano went grocery shopping. When Lucano returned a short time later, she found Pardo frantically holding the unconscious toddler, Alvirez said. "The child did get away from him for a few minutes and managed to crawl out of a patio door and slip into the pool," Alvirez said. The couple rushed the child to a nearby hospital, where paramedics resuscitated him. Later, the gravely traumatized child was airlifted to Children's Hospital in Los Angeles, a world-renowned trauma center that specializes in severe pediatric care, for specialized treatment, Alvirez said. During the first week in the intensive care unit, Pardo never left his son's bedside, Alvirez said. But a few weeks after the child was stabilized, doctors concluded that severe brain damage would confine him to a wheelchair for life, Alvirez said. Less than six months later, Pardo and Lucano ended their relationship, and Pardo stopped visiting his son. Pardo also neglected to contribute to Matthew's medical costs, which surged up to $340,000 within the first year, Alvirez said. "We had to sue [Pardo] on his $100,000 homeowner's insurance policy, and I recommended that Elena sue Bruce beyond the policy," he said. "She was not a vindictive type, and she knew he was living with overwhelming guilt and wanted to only pursue his policy." Alvirez said he never had any problems with Pardo and was able to collect the $100,000 policy to pay off medical bills and set up a special needs trust of $240 per month for the rest of Matthew's life. The boy is now 9 years old, Alvirez said. "Once the settlement was reached in August 2002, Bruce stopped communicating completely and never saw Matthew or Elena again," Alvirez said. He said Lucano had maintained occasional contact with Pardo's mother over the years but she was unaware that Pardo had remarried and never anticipated the violent path that ended his life and left nine other people dead. "She is overwhelmed by all of this, but Elena has managed to provide for Matthew as a single parent with a part-time nurse and a full-time job," Alvirez said. Lucano declined to be interviewed by CNN, Alvirez said.